On February 9th Recovery Café hosted a visit from two individuals with a deep commitment to their own recovery journeys and to making recovery support accessible for others. 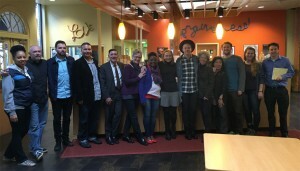 Michael Botticelli, the Director of the Office of National Drug Control Policy, aka, “the Drug Czar” and rapper Macklemore toured Recovery Café and met with a dozen members of our community. Both Botticelli and Macklemore conveyed the importance of speaking out about ones’ own recovery as a way to reduce the stigma of addiction. Botticelli shared how much progress has been made regarding being gay in America and he is hopeful that similar progress can be made regarding the stigma around addiction and other mental health challenges. Macklemore talked openly of his own recovery journey as did several of our staff and Members. Thank you Macklemore and Director Michael Botticelli for your visit!